Plants consume oxygen via the roots for the process of ‘respiration’. Oxygen also aids in keeping the nutrient sterile by satisfying the oxygen demand of aerobic processes. For these 2 processes to occur, the oxygen must be dissolved in the nutrient solution. This is achieved via ‘aeration’. Simply exposing a body of water to air does not achieve adequate aeration. ● Delivering the nutrient solution via spray jets. ● Designing the hardware (for recirculating systems only) so that the nutrient splashes into the reservoir when it returns from the roots. In either case though, good ventilation must be provided for the space where the aeration occurs. Failure to achieve this will cause the air in that space to become depleted of oxygen - Fig 9.5. ● An air stone and air pump can also be used. 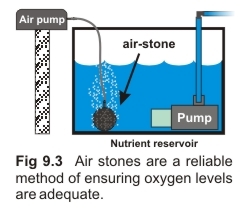 Air stones have the added advantage of promoting circulation of the nutrient solution to ensure uniformity (Fig 9.3). Make sure to locate the pump in a well ventilated area.